The riveting new thriller from bestselling Edgar Award nominee D.W. Buffa It was a strange case, a great case, a case that, once it got to trial, might well change forever the history of the United States. Other presidents had been murdered, but no one who had killed a president had ever been brought to trial. I did not want any part of it. 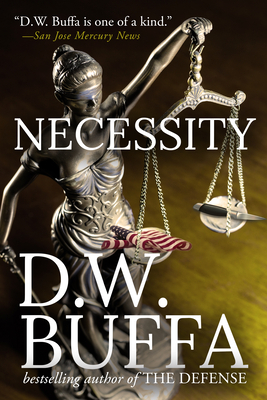 NECESSITY is the riveting new thriller from bestselling Edgar Award nominee D.W. Buffa in which criminal defense attorney Joseph Antonelli finds himself embroiled in the most controversial and explosive trial in American history, representing the man accused of murdering the President. When renowned lawyer Joseph Antonelli--the defense attorney who has never lost a case--takes on the most shocking and controversial case of his storied career, he has no idea of the depths of trouble he's about to get into. A man has murdered the President of the United States, but has invoked the "Law of Necessity," which states that a crime is justified if it serves the greater good and thus prevents a greater harm from occurring. As the nation watches the trial of the century, Antonelli must try a case with all eyes on him...and his own life on the line. NECESSITY will enthrall half of the country and infuriate the other half. Everyone, however, will want to read it. D.W. Buffa was born in San Francisco and raised in the Bay Area. After graduation from Michigan State University, he studied under Leo Strauss, Joseph Cropsey and Hans J. Morgenthau at the University of Chicago where he earned both an M.A. and a Ph. D. in political science. He received his J.D. degree from Wayne State University in Detroit. Buffa was a criminal defense attorney for 10 years and his seven Joseph Antonelli novels reflect that experience. The New York Times called The Defense 'an accomplished first novel' which 'leaves you wanting to go back to the beginning and read it over again.' The Judgment was nominated for the Edgar Award for best novel of the year. D.W. Buffa lives in Northern California. You can visit his Official Website at dwbuffa.net.